Never have any bibs in a nice enough state for baby to wear in public? Well, look no further! 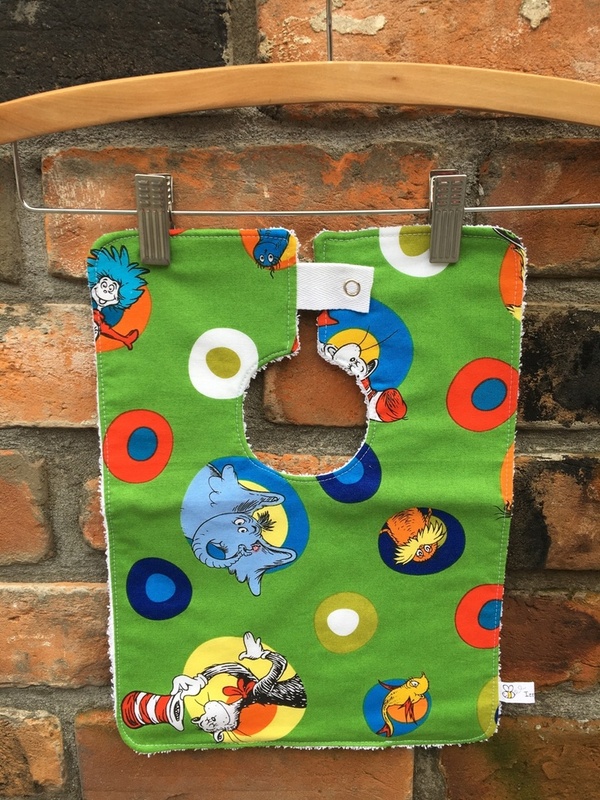 These FUNKY Izzy Bee Baby bibs are made from a soft, 100% cotton fabric on the front, and a super-absorbent white towelling on the back. The vibrant, quirky prints make these the perfect ‘GOING OUT’ bib. No messing around with ties or velcro - a single dome at the back ensures once they’re on, they stay on! The edges are finished with a single stitch trim. Generously sized to catch anything that might decide to come back out! And most importantly, they’re machine washable. Measures approximately 33cm x 24cm. The neck hole measures approximately 8cm, and the gap at the back where the tag is makes it quite roomy and therefore suitable for infants anywhere between a few months - 2 years. Please contact me if you have any further queries re sizing. If you would like more than one bib, we have a '3 for $30' promotion. Please choose the '3 for $30' listing and make a note of which three bibs you would like to purchase. Izzy Bee Baby boutique bibs are proudly designed and hand-made in NZ!